I recently received complaints from residents about the overgrown state of the grass area north of High Mill at Steven’s Yard, adjacent to Shepherd’s Loan. I am very grateful to the City Council’s Planning Enforcement Officer who, at my request, contacted the landowners to get the very overgrown grass cut. As you can see below, the owner has now taken action and the area is now looking much better. I have asked the City Council to relocate the neighbourhood recycling facility at High Mill a short distance away from its current location, following complaints from residents about the noise of bottles being dropped into the recycling units that are currently situated close to residents’ homes. There’s an obvious alternative site in the adjacent car park. I also asked for a new recycling point for the residents of Osborne Place, following residents’ requests for this. Further to our earlier discussions, I have a few updates for you on the Neighbourhood Recycling Point at High Mill Court & your request for an additional NRP at Osborne Place. 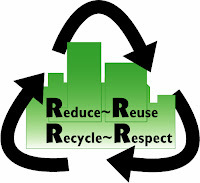 We are in the process of requesting permission to move the High Mill Court NRP (neighbourhood recycling point) from its existing position immediately outside the main doorway to an area at the top of the car park. Once we have received a response on this we will update you further. I have asked that residents are fully consulted on the proposed re-siting of the High Mill location. I recently also asked for better signage to the houses in the Pinegrove Gardens part of Osborne Place. 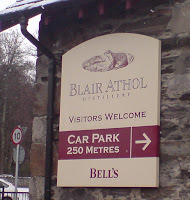 This was agreed and erected yesterday but there was a small problem – the signage had an error on it! All credit to the City Development Department – a replacement sign has been promptly ordered. I have today published my January 2009 update to West End Community Council. The Community Council meeting takes place this Tuesday at 7pm at Logie St John’s (Cross) Church Hall. 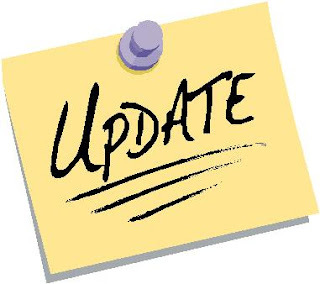 You can download a copy of my update by going to http://www.dundee.prai.co.uk/resources/sites/82.165.40.25-4354cb46e84541.81564487/West%20End%20Ward%20-%20Various%20Resources%20Directory/West%20End%20Community%20Council%20Updates/West+End+Community+Council+Update+-+January+2009.pdf. 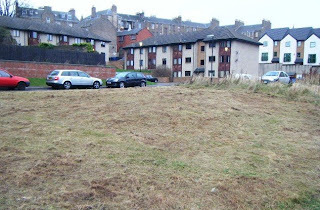 As reported in last night’s “Evening Telegraph”, I am pleased that, following the intervention of the City Council’s planning enforcement staff, a Belgium-based developer has finally commenced the tidying of a badly overgrown area of ground in the Shepherd’s Loan area. 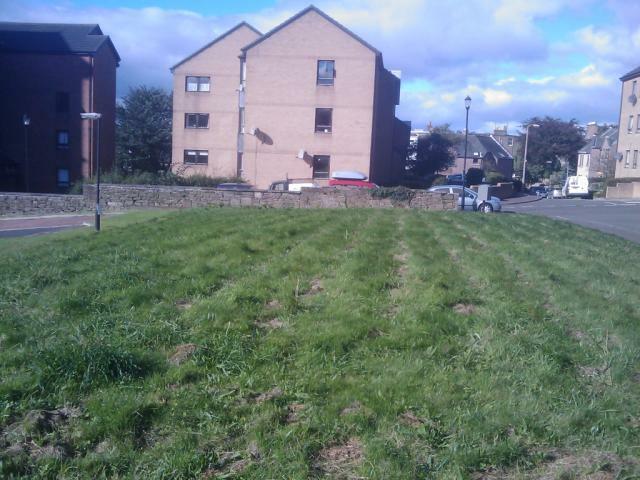 Residents and I had contacted the City Council regarding the badly overgrown condition of the ground south of Steven’s Yard near to High Mill. 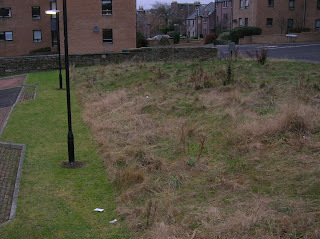 The ground had become highly overgrown and residents were rightly complaining about the eyesore. Clearly the concern in such instances is that neglected ground becomes a magnet for fly-tipping, so I am pleased that following the intervention of planning enforcement staff, who served a notice on the owner, work to cut the overgrowth and tidy the ground has now been started. 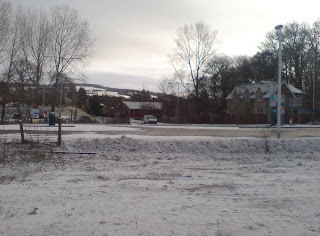 The ground has been subject to a previous planning application for 2 dwellings which was refused by the City Council – the decision to refuse was upheld by the Scottish Government Reporter in 2007 (go to http://bwarrant.dundeecity.gov.uk/publicaccess/tdc/ApApplication/application_detailview.aspx?keyval=JOZFG0GC03D00 for further details). 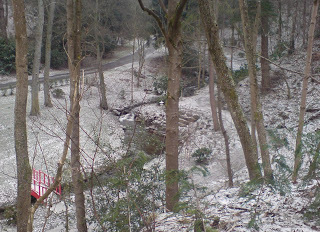 The photo below shows the partly completed tidying works. * Attending the 2008 Poppy Appeal launch at the City Chambers. * A meeting with the City Council Leader – the Council autumn recess has just finished and its back to council committee meetings on Monday. * A meeting with two representatives of the City Centre and Harbour Community Council (DCCHCC) – the West End Christmas Week team and DCCHCC are working together on one joint activity around Christmas Week – with the West End joining in the “Best Christmas-dressed local shop window display” competition DCCHCC runs. There will be a separate category for West End shops and its great to see two different community groups working together on a joint activity. * A meeting with our very helpful pyrotechnician, to plan this year’s fireworks display as part of the West End Christmas Week. * A meeting to plan the agenda for the next Planning & Transport Committee. 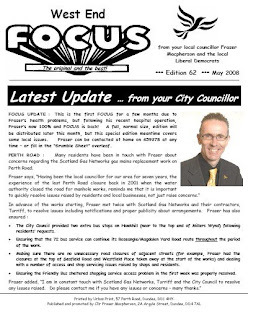 With thanks to all who helped this morning, most of the special edition of FOCUS for the area of the West End Ward around the Perth Road roadworks, was delivered and the remainder is now with those local residents in the area who kindly deliver their street for me. The FOCUS doesn’t just cover the Scotland Gas Networks issue, but also covers local bus shelter issues, an untidy area in Steven’s Yard (at High Mill) and a residents’ parking update. You can download a copy by clicking on the headline above.